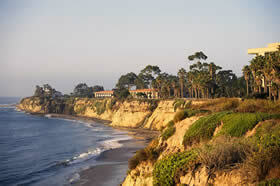 The first 4 hotels are located in Goleta approximately 4 -5 miles from campus (7-10 minutes driving time). The last property (Hotel Oceana) is located downtown Santa Barbara approximately 12 miles from campus (20 minutes driving time). All rooms have high speed internet access, refrigerator, coffeemaker, hairdryer, iron and ironing board. Rate includes continental breakfast buffet daily and evening hospitality Monday through Thursday. Complimentary shuttle service to and from the Santa Barbara Airport. Call the hotel directly at 805-967-3200 and ask for Shelagh Erwin to receive the above rates as part of EDISON 17. Full service restaurant; heated pool in palm garden setting. Holiday Inn’s nationally recognized high service standards; complimentary airport shuttle between 6 am–10 pm. Complimentary cooked-to-order breakfast daily, complimentary evening beverages Monday – Saturday. Heated pool and spa. Complimentary airport shuttle 7 am – 7 pm with 24 hour notice. Please identify yourselves as part of EDISON 17 conference when booking the reservation. Complementary breakfast in the morning, complimentary wireless internet, heated pool and jacuzzi. Please identify yourself as part of EDISON 17 when booking the reservation. Complimentary deluxe continental breakfast daily, complimentary wireless internet access in rooms and on hotel grounds, complimentary 2-hour beach cruiser bicycle rentals, two outdoor pools, fitness center, and Jacuzzi. Minutes away from the pier, State Street, and many other Santa Barbara attractions.